I've been trying to master freehand rose nail art like in the Japanese nail mags without success for ages now. It's so frustrating as you can probably tell I LOVE rose manicures and the manis I've seen in the mags look so good. Every time I tried, the roses ended up looking like multi-coloured blobs! I was determined last week to try and make the roses work but in the end they still looked crap, just big and awkward =( I guess they looked somewhat alright from far away so don't look too closely at my pictures haha. Pinky, middle and index fingers: I started off with 3 coats of Orly Lemonade. I then used a dotting tool from Born Pretty to place dots using China Glaze Grape Pop. I then used a small brush (also from Born Pretty) to add small lines using NARS Pokerface and China Glaze Sugar High. For the leaves I used OPI Jade is the New Black. Ring finger: I used 2 coats of NARS Pokerface and then added a glitter half moon using Art Deco nail striper in gold glitter. Thumb: 2 coats of OPI Glitzerland. I loved the combination of yellow, purple and gold but I just wish I could get the hang of freehand roses! 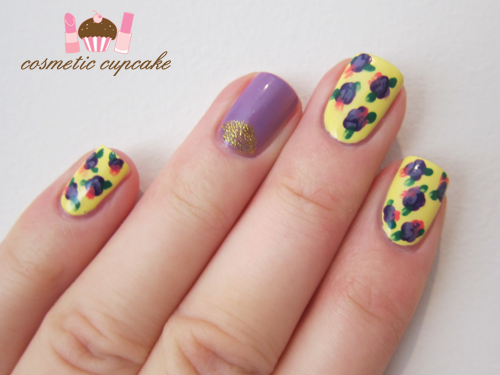 What nail art do you love but can't seem to get right? LOVE the Orly Lemonade. Also yellow + purple is a good go-go. But the flowers looks so cute, you shouldn't be so hard on yourself! I think this looks pretty good! 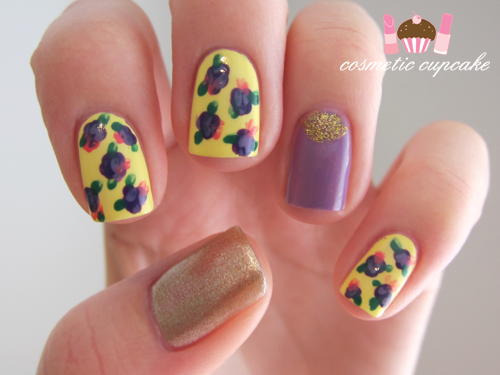 I need to try rose nail art myself! I dont think this is a fail . I like this a lot . I don't see a fail. I are a silly girl. I loves it. I think its cute. 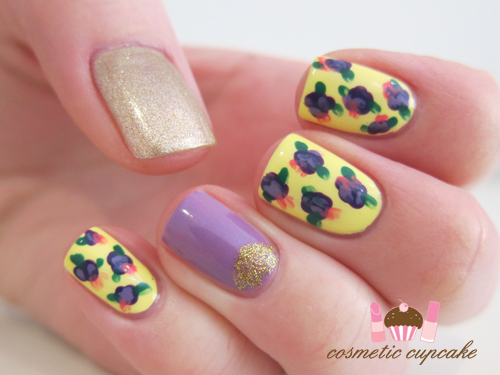 very pretty color combination michelle! NARS Pokerface looks so flattering against your skin tone! I still think it looks pretty. :D I guess with more practice, you're be able to improve your flowers. Still~ great job! @MonikaL It's such a cute yellow isn't it?! Awww thanks Monika, I just want my roses to look like the magazines! @Jessy: Thanks Jessy! NARS Pokerface is such a pretty polish. Glad you like it! @Aysh: You are so sweet lovely!! ^_^ Thanks for your kind words about my mani. You need to give it a go yourself!! @coffretgorge: Oh thank you!! I need to use Pokerface for a full mani, it's such a pretty pastel purple. LOL I haven't even opened my konad sponging kit so you're miles ahead of me! @tiffyama: You're very sweet hun! I need to practise more definitely. @Alice: Oh great idea Alice. I'll keep that in mind for next time!